Cleopatra VII was of Macedonian descent. Ptolemy was one of the generals of Alexander the Great upon who’s death the Greek Empire was divided yielding Egypt to the house of Ptolemy. 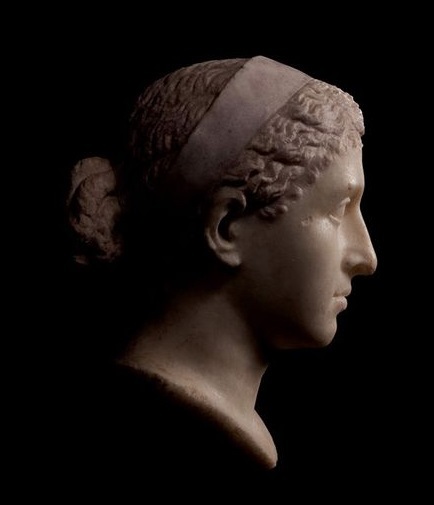 This being her heritage, Cleopatra was the eldest daughter of Ptolemy XII Auletes, King of Egypt, whom she succeeded as joint ruler with her brothers Ptolemy XIII and XIV. As a young girl growing up in the palace of Alexandria, Cleopatra learned well the art of court intrigue. She also appears to have developed a loathing for her ambitious brother Ptolemy XIII. In 51 BC, Auletes died, leaving Cleopatra and Ptolemy XIII as co-rulers of Egypt. Cleopatra was only 17 years old when she became Queen of the Nile kingdom. Almost immediately, a feud began and with the aid of his mercenary advisers, Ptolemy expelled Cleopatra from the throne. Had he killed his sister perhaps history would have been completely different. But expelling Cleopatra would one day prove fatal not merely to her brother, but also to the political world of Rome. Ptolemy relied upon such men as Pothinus and Achillas to assume the burden of administration in Alexandria. Cleopatra, in turn, raised an army to counter the forces of Achillas and was about to battle Ptolemy when Julius Caesar arrived in Alexandria in October of 48 BC in hot pursuit of Pompey the Great. Instead of confronting Pompey, Caesar was presented with his head as a gift from Ptolemy. This act gravely offended Caesar and the Roman legions. 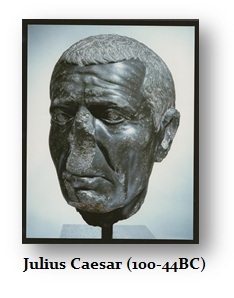 Caesar immediately declared his intention to settle Egyptian affairs as the official representative of Rome. Cleopatra immediately began to charm Caesar having herself delivered to him in a carpet. Her charm worked and Cleopatra was installed on the throne of Egypt. In the clash with Ptolemy XIII’s army, the great Library of Alexandria went up in flames creating yet another loss to posterity. Following the death of Ptolemy XIII, Cleopatra became virtual sole ruler of Egypt. She elevated her youngest brother, Ptolemy XIV as her royal consort. But Cleopatra was the true power on the thrown of Egypt. She immediately became a loyal supporter of Julius Caesar. Cleopatra bore Caesar a son who tradition holds was named Caesarion. Cleopatra then traveled to Rome where she remained in a separate house until Caesar’s assassination in 44 BC. Cleopatra was not popular among the citizens of Rome. In the aftermath of Caesar’s death, she fled back to Egypt. It was in Alexandria where she established a temple to Julius Caesar who was the father of her son and could thus be the heir t o a Roman throne. Cleopatra commissioned a bust of Caesar carved from royal stone – black basalt. She remained outside of Roman politics until she met Marc Antony in Cilicia. She then worked her charm again and the two became lovers of legendary proportions. 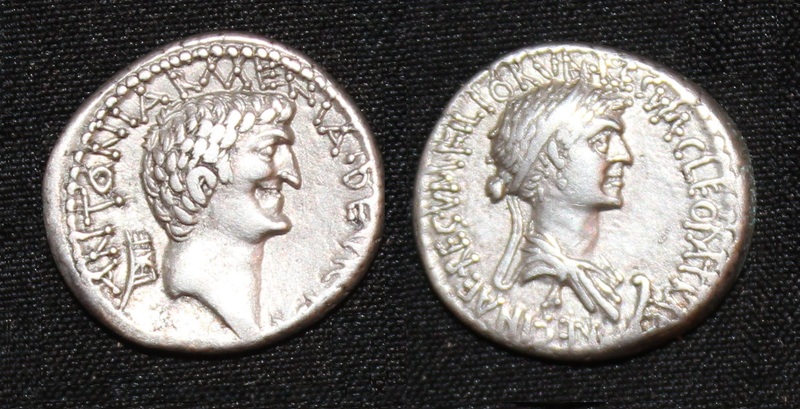 More than a mere love story, her association and love affair with Mark Antony has been memorialized in inscriptions and documented by numerous coinage issues baring their portraits conjoined together. In Rome, Octavian anticipated civil war. He began a campaign of propaganda against the Antony and his Egyptian whore, as she became known in Rome. Their open alliance gave him more than enough scandalous material, and in 31BC the conflict erupted into the final battle for control of the Roman world. 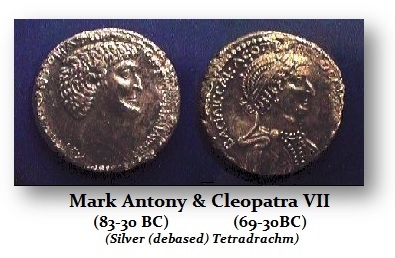 Antony was financed by Cleopatra. This immense wealth is evident in the legionary denarii that have survived issued to pay the legions of Antony’s army. But even with such financial support, Antony could not win the battle of ACTIUM. Cleopatra’s premature retreat from the battle had an impact on the outcome. Cleopatra sailed off to Alexandria, where Antony followed as a pandering lover. Trying to salvage her realm, she negotiated with Octavian but to no avail. Antony killed himself. After failing to win Octavian’s affection, Cleopatra joined her lover in one of the most celebrated suicides in history. She died at the age of 39; her desires and ambitions proved the undoing of Marc Antony, the death of the Roman Republic and ensured the supremacy of Augustus and the birth of Imperial Rome. In her death, the line of the Ptolemies that had stretched back to the age of Alexander the Great came to an end. Egypt was seized and became just another Roman province. As for Caesarian, he was reportedly killed by Octavian. Marc Anotony and Cleopatra did leave a heir – a daughter. She was married to Juba II of Mauratania. ANTONI . ARMENIA. DEVICTA. CLEOPATRAE . REGINAE . REGVM . FILIORVM REGVM.